The Chicago Peregrine Program inspired me to write a quick blog on the colors and shapes of eggs. Bald eagles have white eggs, peregrine falcons have eggs that range from light cream through brick red, and red-tailed hawks have pale eggs that are lightly splotched with brown. How and why do the birds we watch lay differently-colored eggs? In general, female birds inherit egg colors and patterns from their female parents, who are ZW heterogametes. Egg-shell is made primarily of calcium carbonate, a white material, so the default color of all eggs could be considered white. As an egg moves down a female bird's oviduct, it squeezes or presses against glands that produce colored pigments from the breakdown of hemoglobin. Some colors (blues and greens) are applied very early on in the shell forming process, while others (brown) are applied quite late. Color may be applied relatively evenly or in drips and drabs depending on the bird and the speed of the egg through the female's oviduct. If the egg is stationary or moving very slowly, it may be solid, blotched, or spotted. If it is in motion, it will be streaked. Coloring eggs carries a metabolic cost, so why aren't all bird eggs white? It's believed that birds with white or nearly white eggs have nesting strategies that hide their eggs from predators without the use of color. They might nest in cavities like barn owls, cover their eggs in vegetation like geese, or begin incubation immediately, like bald eagles. Since the eggs aren't visible to predators, camouflage colors and/or cryptic markings don't provide a survival advantage. Birds that lay colored eggs tend to nest in places or ways that are more visible to predators. Peregrine falcons, for example, don't usually begin full incubation until after their third egg is laid. The red color and light speckling helps conceal peregrine eggs when Mom and Dad aren't sitting on them and could make the eggs harder for nest invaders like raccoon to find. Ten or 20 seconds might buy enough time for enraged parents to drive nest intruders away. So why do red-tailed hawks lay lightly speckled eggs while eagles lay white, highly visible eggs? Both birds begin full incubation right away and nest in fairly similar ways. We don't know for sure, although eagles in general are highly visible (giant nests, flashy black and white colors, six-foot wing spans) while hawks tend to be more concerned with concealment. The differences in egg-coloration might reflect some aspect of their lives we don't understand, but either way, egg-coloration is driven by survival. Hawks must need to conceal their eggs where eagles do not. Predators aren't the only problem birds face. Some birds commonly dump or lay eggs in the nests of other birds. Splotched, spotted, or streaked eggs may help individual birds recognize their own particular markings and reject eggs that don’t match. So why don't Canada geese, which egg-dump, lay patterned or marked eggs? In this case, I suspect that non-parental eggs don't impact the survivability of parental eggs very much. Canada geese are precoccial, so young require less parental investment once the eggs hatch. Canada geese also time hatching quite tightly, so an egg dumped at the wrong time won't survive. How about egg shape? Peregrine falcons, Bald eagles, and Red-tailed hawks lay differently colored eggs, but the eggs of all three species are elliptical or oval in shape. We used to think that egg shape was influenced by clutch size and the need to stack eggs, calcium availability, and/or 'the roll factor' - ie, heavily tapered eggs roll in a tight circle instead of rolling off ledges. But in 2017, Professor Mary Caswell Stoddard and her team found that the shape of an egg correlates with the hand wing index, a measure of the shape of the wing. Faster, frequent flyers have longer, narrower, pointier wings, which translates into a high HWI. Birds that are weaker and less frequent fliers have shorter, broader, more rounded wings, which translates into a low HWI. So why would flying ability influence egg shape? The maximum size or width of a stretched oviduct is constrained by a bird's body size. Faster, frequent flyers have reduced body sizes and abdominal cavities relative to weaker, less frequent fliers. Their muscular, streamlined body plans and narrower oviducts can't accommodate large, round eggs, but their eggs still have to carry enough nutrients to support embryonic development. These birds maximize egg volume by forming elliptical (oval) or asymmetrical (one round, blunt end and one narrow, pointier end) eggs that can pass through their narrow oviducts while still carrying the nutrients their embryos need to develop and grow. So how do they do it? While I tend to think of eggs as being shaped by their stiff outer shells, an egg's inner membrane determines its shape. Birds that form elliptical or asymmetrical eggs lay down a membrane that is thicker on the big end and thinner on the pointy end. As an egg moves through a bird's oviduct prior to eggshell development, the thinner end is squeezed and elongated to produce an asymmetrical egg. In general, egg color and shape is influenced by survival. Female birds that produce more young will out-compete female birds that don't. Egg-color and shape may be influenced by overall health (healthier birds tend to lay more vibrant eggs), metabolic cost, the need to hide from predators, the need to identify one's own eggs, and the shape imposed on an egg by the parent bird's body plan. In all cases, our parents have demonstrated egg-ceptional egg-care! We look forward to eggs soon! Book: Oology and Ralph's Talking Eggs. I strongly suggest this book for the bird lover in your life. It is a beautiful book and a wonderful read. A Moment of Science by Indiana Public Media. We are sorry to announce that Four, the single remaining bird from the 2014 Decorah alumni to remain in the wild, was electrocuted on Tuesday, March 2nd. 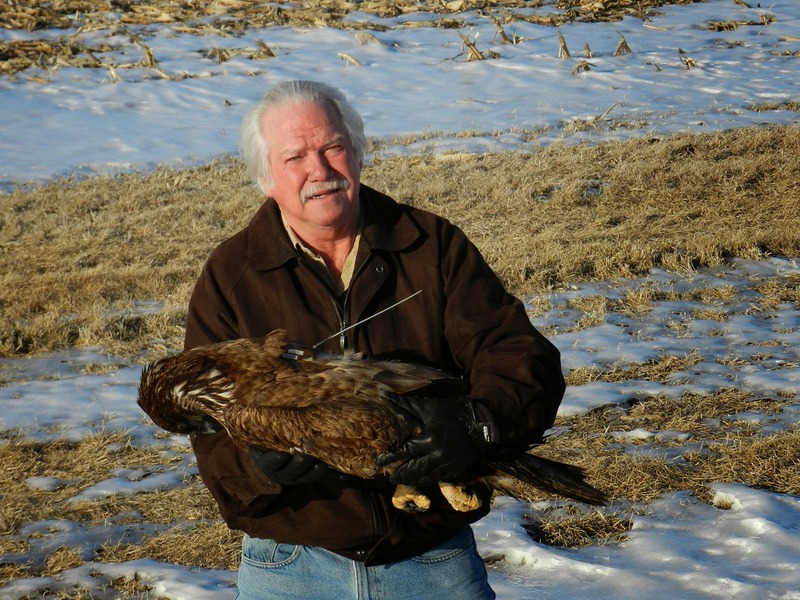 This is the fourth eaglet from Decorah that we know of to die from electrocution. Bob and a good friend picked her carcass up on Thursday and Bob and Brett examined her on Saturday and verified the cause of death. Bob found her lying underneath a utility pole. He took photographs and sent them to a consultant, who told us the pole was unsafe and made suggestions to improve the safety of this pole and other poles in the area. We brought them forward to Alliant Energy/Interstate Power and Light and are waiting for a response from them. Why do the eaglets keep perching on power poles? Bob theorizes there is a behavior difference between urban and rural eagles. Rural eagles are programmed to perch in trees because that is what they have available. But urban eagles, including our beloved Decorah family, are exposed to power poles and other man-made structures from the beginning. There are vast amounts of power poles serving our needs. With eagles beginning to nest in close proximity to man - something new for both species - he believes electrocution will be an increasing concern for urban-fledged eagles and utility companies. Report electrocuted birds and other animals to your power company. Electrocutions are deadly to animals, harmful to equipment, and potentially dangerous to human beings. Report collisions to your power company. While our eagles have been electrocuted perching on poles, collisions are also deadly. Swan diverters and other deterrents can be installed. If you are a member of an electric cooperative, make your concerns known to the board. I know of at least one electric cooperative in the process of retrofitting all their poles are safe. Electrocutions destroy equipment, require unscheduled repair time, and are expensive. We will continue our work with the electric distribution industry to address this issue and are researching deterrents for the poles near the nest and elsewhere.